Passover seder in my family is the event of the year. For as long as I can remember we would start preparing for the seder well before Purim, not for the cleaning, cooking or purchasing, but for the games, activities, discussions and parody songs that would be created for the seder that year. As three generations of our family sat together, we ate the same foods, told the same story, read the same Haggadah and responsive readings every year, but the conversations changed and the excitement always grew each year. Around the world, Passover is the most observed holiday on the Jewish calendar. While not all Jews observe the laws of Passover to the same extent, the narrative of our people lives on through this holiday. Every family has their own tradition that connects to Passover. And, the experiential nature of the Seder lends itself to the enjoyment and understanding of young and old alike. The holiday of Pesach is often spoken about in Jewish education circles as the initial example of experiential education. Coming before we had summer camps and youth groups to depend on to give our students an experience, the seder provides all of the essential elements to an educational experience. It begins with the lesson plan, the 15 steps that let the learner know what will be covered during the “lesson.” The Torah clearly gives us our educational objective – the SWBAT (by the end of the lesson, “Students Will Be Able To”) – in Shemot, chapter 13, verse 8, when it tells us that we are to tell our children on this day that it is because of what God did for me when I went forth from Egypt. And so, we set out on this journey with the understanding that the seder is supposed to in some way explain to us and make us feel the connection with our ancestors in Egypt and the power of faith in God that brings us to each Pesach. It is from this love that I offer the following suggestions to liven up the experience of your seder. They have been compiled from many years of trying to please an audience from 3 years old to 85 years old. 1. Make a large poster board that lists the order of the seder on it and move the arrow down after each time you complete a step. This way, no one has to ask when dinner is. 2. Instead of waiting to serve the meal at Shulchan Orech, offer a salad course, or dip like guacamole after the karpas so your guests’ tummies don’t start to rumble. 3. Pre-assign parts to your seder guests, asking each family to write their own meditation on a step of the seder to be shared that night. 4. Have your guests come in costumes; whether they dress as Egyptians, Israelites, or the 10 plagues, you’re sure to have a fun time. Or, hold your seder in the family room so that you can really recline! 5. Create a mini seder plate for each guest. 6. 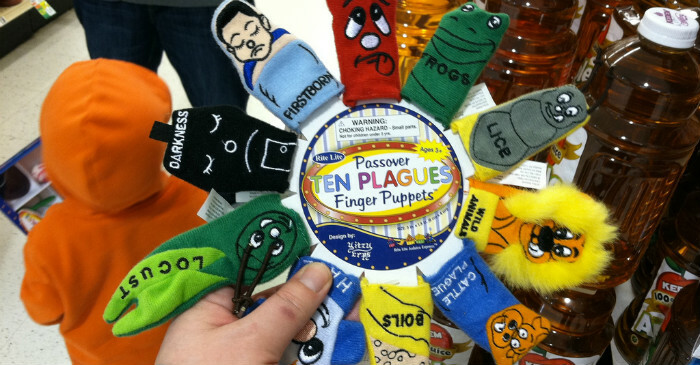 When you reach the 10 plagues, instead of just reading through them, play 10 plague charades and have seder participants act out the plagues and other participants guess which plague it is. 7. Make your own Passover themed game to entertain guests after desert before finishing the Seder. “Apples to Charoset” is my favorite, a take on Apples to Apples. You can also play Passover trivia in the name of “Who Wants to be a Minyannaire,” “Wheel of Freedom,” “Pyramid,” or the ever popular “Jewpardy.” Feel free to tweet me for any these games – they are our family’s creation! 8. If you have many seder guests over 21, have each of them bring a bottle of kosher for Passover wine to share and do a wine tasting with each glass. 9. Passover marks the freedom of the Israelites. One sign of freedom is the ability to ask questions. The sage Hillel used to put unexpected items on his seder table to provoke question asking. 10. The seder has many numbers associated with it: 3 matzot, 4 cups of wine, 4 sons. For each pairing, see if you can come up with your own dedication for each one with relation to what it symbolizes. Hag Pesach Kasher V’sameach, may this be a holiday of joy and rebirth for each of us. CONFIDENTIALITY NOTICE: This electronic transmission and any attachments constitute confidential information which is intended only for the named recipient(s) and may be legally privileged. If you have received this communication in error, please contact the sender immediately. Any disclosure, copying, distribution or the taking of any action concerning the contents of this communication by anyone other than the named recipient (s) is strictly prohibited. Shavuah tov Rabbi Posen, I tweeted you, wondering whether I might be able to get a copy of your apples to charoset game. Hoping you can be in touch before pesach so we can further enhance our Seder. Alon, sending it your way!